This is my 4 year old son Martin. He is a Thomas the Train fanatic so I thought it would be awsome to make him his own Thomas train. I created it with 3 different sized boxes,duct tape, hot glue, foam ball cut in half for the face, suspenders to put it on, a powderd creamer container for the smoke stack, paper plates for the wheels, blue glow sticks that I attatched to the wheels at last minute so it would glow while trick 'or' treating, cotton balls for the effect of steam on the smoke stack and a whole lot of time and creativity.. The best part about the costume is I cut a whole at the bottom of the smoke stack and through the box beneath, then I duct taped a bag underneath it so people could drop the candy down the smoke stack. This part was the biggest "hit". The cost all together was about $20 the biggest part of that was the foam ball that was $12. The rest was in paint. This by all means was the hit of trick 'or' treating in my neighborhood and a bonus that now my son can also play with it here at home now that halloween is over. This was fun and a good project for him to help me with. This is amazing! 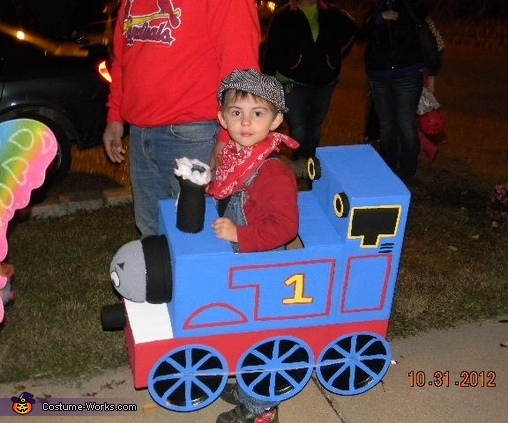 My 4 year old also wants to be Thomas the train for Halloween but i'm not sure i'm as talented as you are! But I think i'm going to give it a try! Thank You so much for posting this on here! Any further details you could provide me I would be forever grateful!